Long time no post! I’m currently doing a bunch of contract work so my own games are taking a bit of a back seat (temporarily!) Anyway: recently Apple have done a sweep of older apps to make sure everything is alive and updated; as the title of this post may suggest, Stargazing falls a bit short of requirement. I’m not ruling out putting up a new version at some point of this now three-year-old (!) game, but it’s not going to happen any time soon. To say farewell (or see you later?) to Stargazing iOS, I have made it free because why not – it will be there for just a few more days before the app is removed. 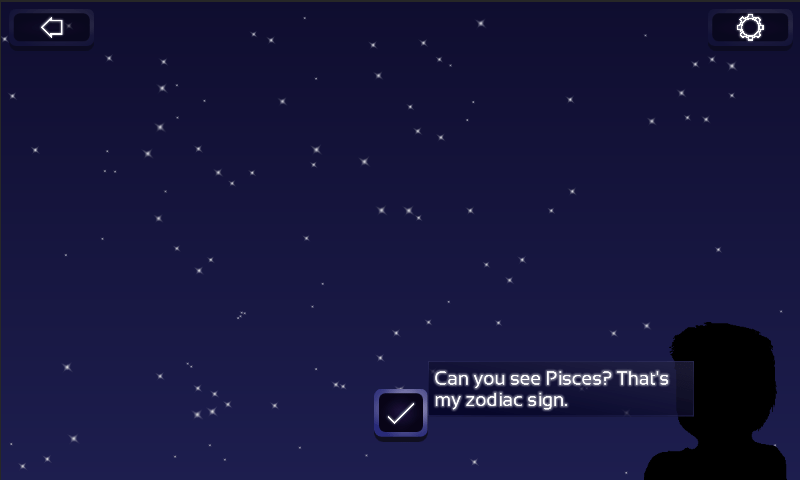 This does not affect Stargazing on Android, which remains available as before. Here it is! Having spent most of this year on it, Generation Ship is now available as a free download. Below are the links to both iOS and Android versions. I say it like “beater” but if you say it like “baiter” I guess that’s okay too. Anyway, Generation Ship is now a few weeks into this testing phase and I’ve had some good feedback from those who have so far given me a hand with testing out the game. I’ve been sticking to weekly builds to keep things moving forward and intend to continue this way until I have a release candidate. The early-game – i.e. the “first time user experience” – has seen the most attention initially as it’s important people can get into the game in the first place. Certain UI elements are hidden at first to hopefully make the game’s first impression less confusing. Beyond this a new mini-game has been added to serve the need for a little something extra to do with a player’s idle time, and a way to speed up economic progress for the impatient. 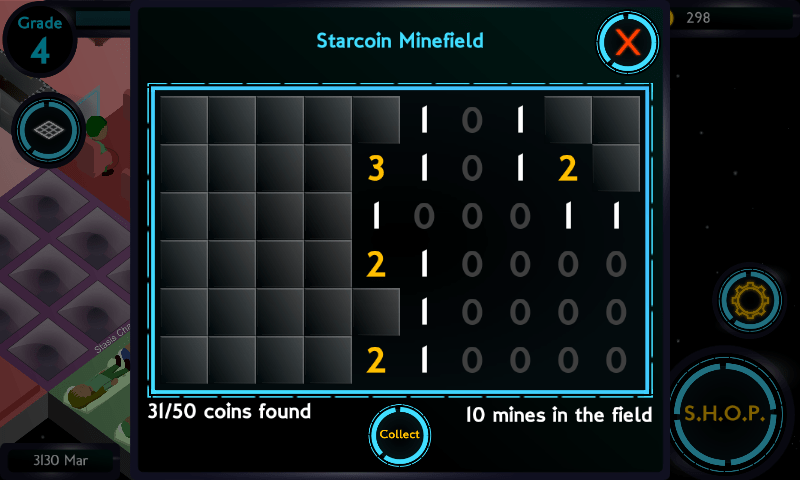 The result is the minesweeper-esque game now accessible from each starcoin mine (any chance for a play on words). Each safe tile cleared will add to a pool of coins that can be collected at any point adding a risk/reward element: do you try for the full clear or get out before hitting a mine and losing the coin pool and the (modest) entry fee? Now I’m making sure the game elements that only come in later, like children and research objects, work as intended. And getting caught up in endless placement/pathing issues. I don’t want to spend much longer on the game but I’d like to get some more people testing it before submission – if you’re interested do let me know! It’s August (I expect you noticed) and Generation Ship has by now become a bit of a monster. It’s taught me a lot about what I could do better in terms of developing a game project of this nature and at times pushed me to the edges of self-doubt and frustration. But finally, finally I am into that phase of testing out the game on a few select guinea pigs and tweaking it into something a person who isn’t me will be able to play. There are still bugs, a couple of missing minor features and a lack of visual polish, but we’re getting there. I have every hope that this will be the last month of development on Generation Ship 1.0. 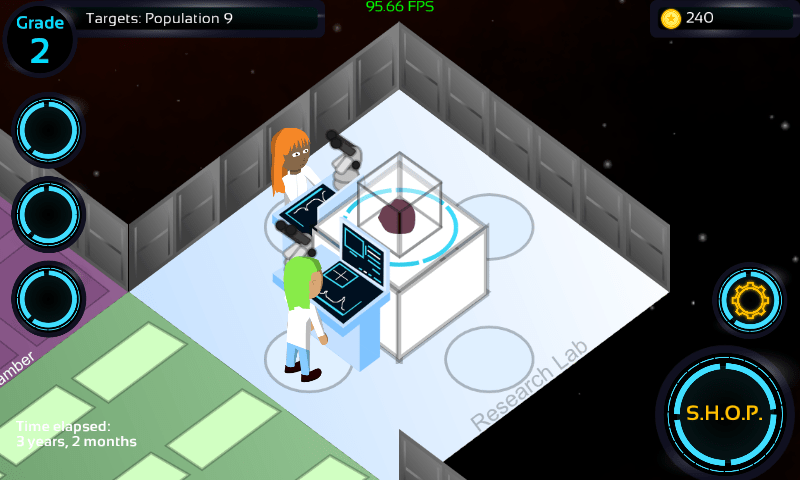 There is an endgame of sorts now: once you have filled your ship up with sufficient people to qualify for a high enough “grade”, you will be able to build a research lab. With this installation your probes will be able to retrieve objects for study, with there being a number to collect. Some of the items will be quite rare so a full collection would be a notable achievement of perseverance. In the very near future I will be looking to get a build on TestFlight so I can look to open up the game to a few more eyes and fingers for further feedback (and to make sure I’m not spamming the cloud server too furiously). Work continues on Generation Ship as I enter what I’m considering the alpha stage (but it helps not having to prove that milestone to anyone). For now I wanted to outline something that is a part of this game that people might not expect from first glance. In truth, Generation Ship has more similarities to something like The Sims than your average space-faring adventure; despite the usual implications of this setting. For me, the colony ship environment allows a closed system for the player to deal with that could almost equally be a remote village – but with the benefit of that sweet future technology. One important system I’ve been developing recently is that of character relationships (specifically as leading to partnerships). 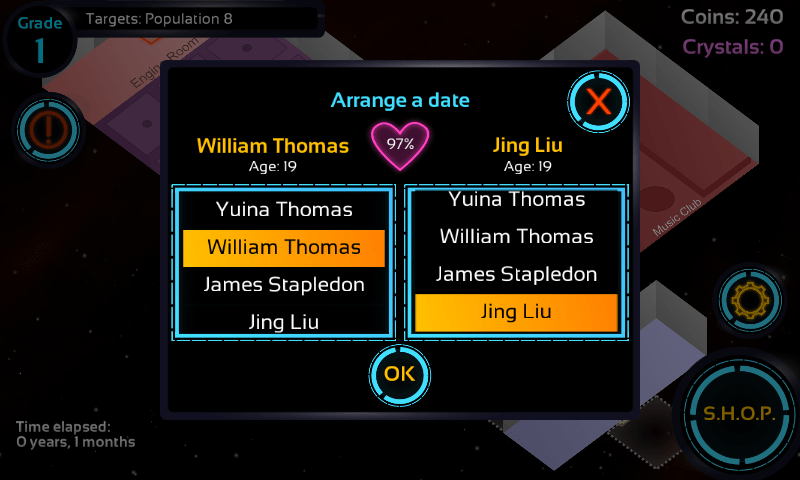 The player will be able to arrange a date at a suitable venue between two available colonists. If a good match is chosen then we can see two characters progress through a dating period to becoming partners. At this point the possibility of introducing ship-born colonists arrives through child birth – the only other way to increase the active population outside of the staggered process of awakening frozen colonists. I do hope to confer some other benefit to colonists in relationships as there should definitely be more to this than child birth (sexual preference is variable for one thing). 1 – place tiles, 2 – build on them. Easy. 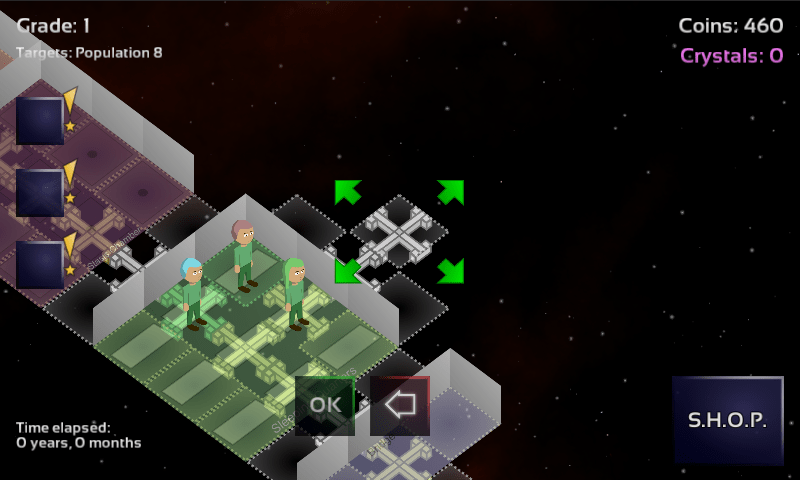 So that’s how colonists are introduced to each other, how about how players are introduced to this game… (Seamless link) I’m hoping players of this game won’t mind a little reading as I’ve started adding these tip pop-ups the first time certain systems are encountered. There might need to be just a little more hand-holding at the beginning but I will try to determine that through testing. I hope to get onto beta testing in a matter of weeks as I’m keen to get towards an initial release as soon as I can! More to come soon! It’s been a while since I last talked about this game so let me show a little of what it’s all about. For this post I’ll focus on the basic structure of the ship and what the rooms do. 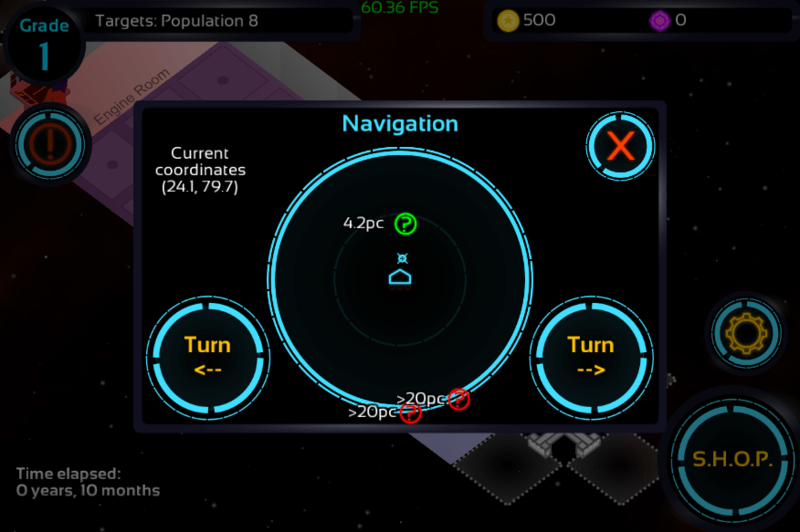 Expanding your ship is at the core of progressing in this game and will be required to gradually add functionality to your ship and to expand the active population you can sustain. Pre-set rooms are purchased from the shop and placed as you see fit: however, there is currently a requirement for a structural foundation to the vessel. This is probably the least casual player-friendly aspect of the game so far and I welcome feedback (and will be actively seeking it when testing begins). There are structural tiles that must be placed to then “anchor” rooms upon them. 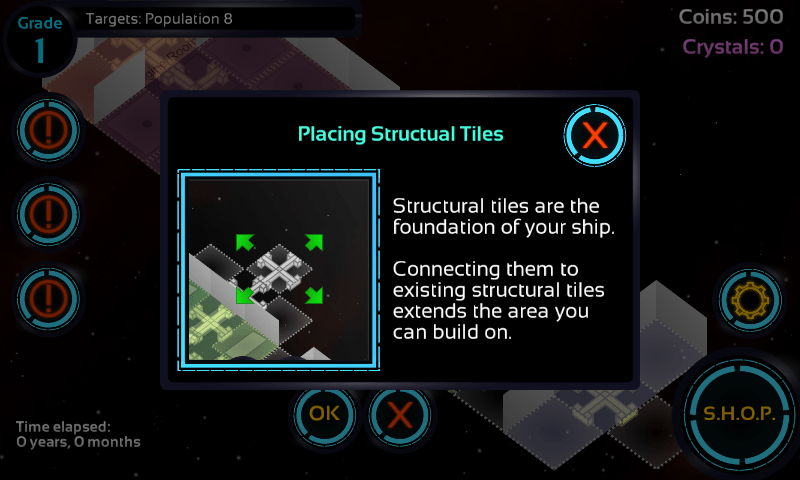 These structural tiles can be seen as the conduits of power/oxygen running right through the ship. Sleeping Quarters – The life of a colonist always returns to here once they have exhausted themselves being useful (or just standing around). 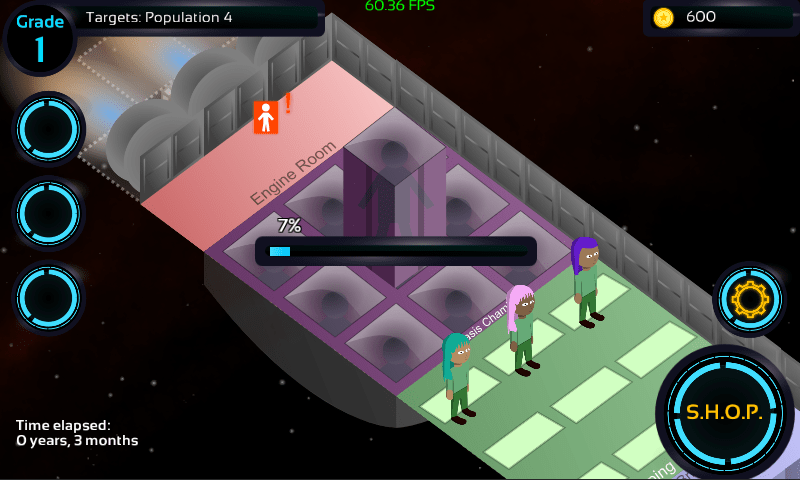 Stasis Chamber – There are many other colonists on board, but most are not initially part of the active crew. When the player has the facilities to support them, more can be revived here. Bridge – The classic command centre of the ship that is required to enter navigation. 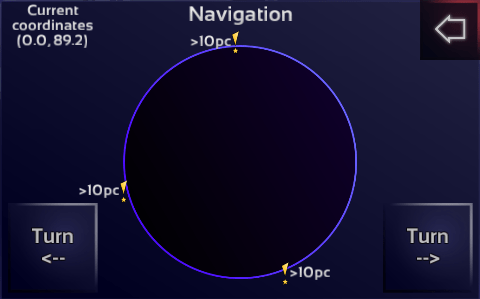 Navigation allows the ship to be directed towards nearby points of interest (see image). Engine Room – The counterpart to the bridge, the engine room is required to fuel any ship manoeuvring as desired by navigation. Starcoin Mine – Every society needs a trading currency and so the loosely connected human race of Generation Ship have Starcoins to pay off their interstellar debts. The mine is something of a trading floor for your financially inclined colonists. Most of this is barely at a first pass level but the focus is on getting the game operating like a game as soon as possible. I’ll be moving onto the characters themselves for a few days next, I look forward to giving them a bit more individuality. And I eagerly await giving the visuals some love before too long (surely every dev likes that part). Working title, I haven’t thought of a proper one yet. This, then, is my next project and due to be my second game release since going “full indie”. The plan has more-or-less stayed the same since I started on it at New Year – I feel like a free-to-play title will allow me to get a game to a lot more people than I have been able to with Stargazing; even if the monetisation issue becomes trickier. I actually started on a PC game concept before deciding that the scale of a mobile game, along with the experience I have of the mobile development and release processes, made sticking with mobile the only thing that really made sense right now. I think I’ve finally reached a point where the game is starting to come together, and I will try to get back into the routine of regular updates, screenshots and all that jazz. This is all very placeholder. The UI atlas is directly copied from Stargazing for now. This is a completely different beast to Stargazing, sharing only the vague theme of “space”. It is a game I specifically see as working on mobile devices – something to pull out of your pocket or switch on your tablet for a few minutes at a time. The goal is less important than the journey: an experience of cultivating a living micro-society that continues to exist at all times. There’s almost something of the virtual pet in here, mixed with more traditional management elements as seen in PC games. 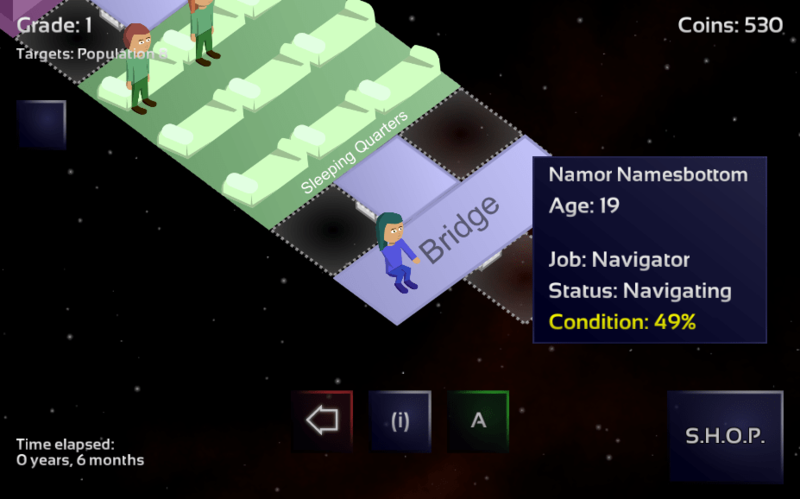 The micro-management requirement will be light, but there will be opportunity to set the environment up as you see fit – connect your ship’s rooms in any number of configurations and assign jobs to the randomly generated characters. Needless to say, at this stage there is still a fairly intimidating amount of work left to do. I plan to once again do everything myself due to the lack of any sort of budget (though actually I do enjoy getting stuck into every part of the process). As far as scheduling goes, my current hope is to be testing a beta version in May, and then getting to a release as soon after as possible. This is the kind of game that I would like to continue to maintain and add to post-release, hoping there will be enough players to help justify that! Future updates will generally focus on specific aspects of the game as they start to emerge, so expect those soon!